In 1995, Edward Chaisson was only 19-years-old when he saw spotted a bright red 1984 Corvette on a Hanover, Massachusetts car lot. “It was a Florida car — a couple drove it from Cape Cod every year,” he said. “The top was faded and it needed a paint job.” He bought it for $7,500 and only drove it for a year before he enlisted in the Air Force. He ended up putting it in storage and later sold it in 2000. “When I was a kid in high school, these cars were it — they were the car you had to have. Driving it was like riding on rails. 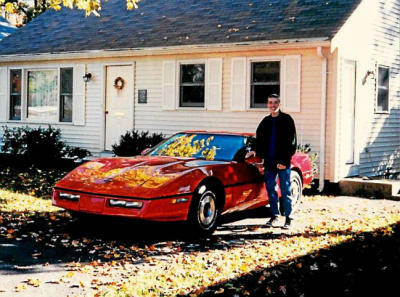 You couldn’t ask for anything better.” Now living in York, Maine, Chaisson has owned five Corvettes since that 1984 came into his life, but he never forgot his very first Corvette. Recently Chaisson received an anonymous tip that his 1984 Corvette was sitting in a barn in North Bennington, Vermont. After running his own extensive search efforts and verifying the tip, Chaisson met up with Richard Rowe, of Cambridge, N.Y., who bought the car two years ago and stored it in a North Bennington barn. Chaisson ended up buying his 1984 Corvette back for the second time for $7,500; the same price he paid for it back in 1995. The car is now sitting in his garage with his other Corvette and motorcycle. He plans on fixing some of the same things that didn’t work 20 years ago – the electronic instrument cluster and the power antenna. No matter how young or old, a Corvette can make a lasting impression on someone!